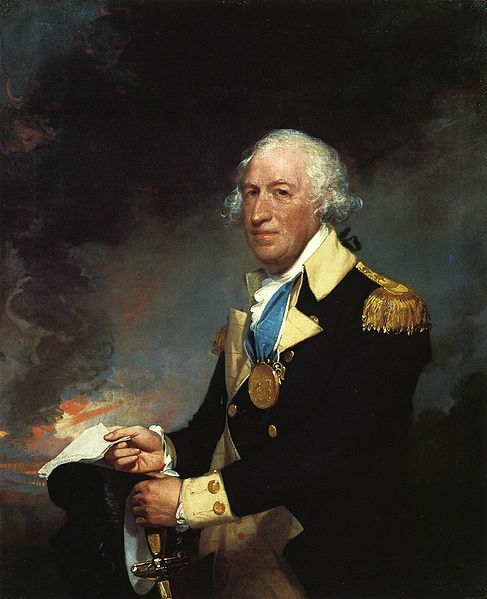 (January 14, 1741 – June 14, 1801) American Revolutionary War Major general who defected to the British Army. While a general on the American side, he obtained command of the fort at West Point, New York, and planned to surrender it to the British forces. In September 1780, after his plan to surrender West Point was exposed, Arnold was commissioned into the British Army as a brigadier general. Among Allen's men concerned in the capture of Ticonderoga in the preceding year was Lieut. John Brown, of Pittsfield, who on that occasion had some difficulty with Arnold. Brown now brought charges against Arnold of malfeasance while in command at Montreal, with reference to exactions of private property for the use of the army. The charges were investigated by the board of war, which pronounced them "cruel and groundless" and entirely exonerated Arnold, and £he report was confirmed by congress. Nevertheless, a party hostile to Arnold had begun to grow up in that body. Gates had already begun to intrigue against Schuyler, and Charles Lee had done his best to ruin Washington. The cabal or faction that afterward took its name from Conway was already forming. 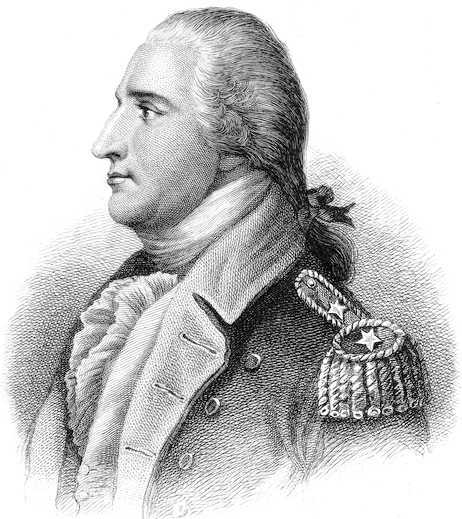 Arnold was conspicuous as an intimate friend of Schuyler and Washington, and their enemies began by striking at him. 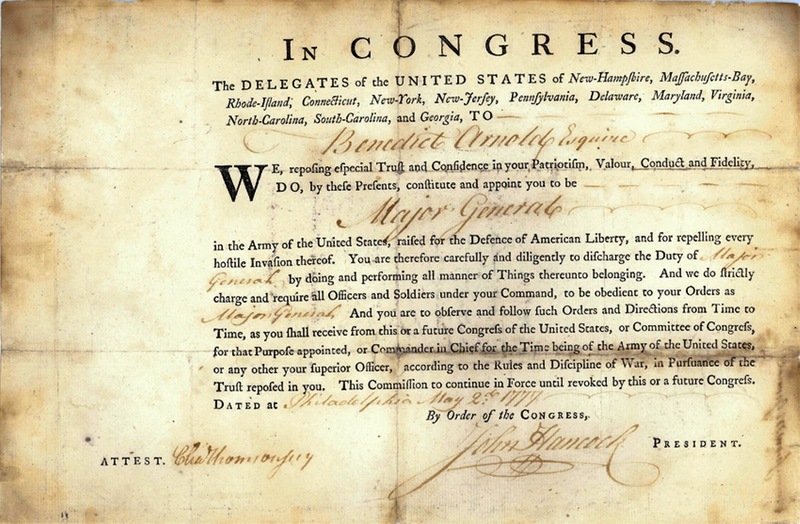 This petty persecution of the commander-in-chief by slighting and insulting his favorite officers was kept up until the last year of the war, and such men as Greene, Morgan, and Stark were almost driven from the service by it. On 19 Feb., 1777, congress appointed five new major-generals--Stirling, Mifflin, St. Clair, Stephen, and Lincoln--thus passing over Arnold, who was the senior brigadier. None of these officers had rendered services at all comparable to his, and, coming as it did so soon after his heroic conduct on Lake Champlain, this action of congress naturally incensed him. He behaved very well, however, and expressed his willingness to serve under the men lately his juniors, while at the same time he requested congress to restore him to his relative rank. 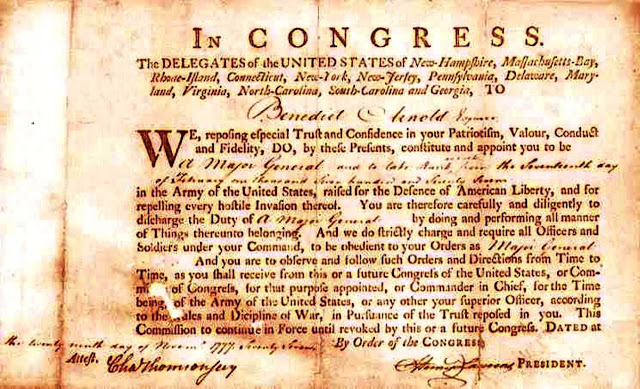 On May 2, 1777, the United States Continental Congress promoted General Arnold to Major General. The last week in April, two thousand British troops under Gov. Tryon invaded Connecticut and destroyed the military stores at Danbury. They were opposed by Wooster with 600 men, and a skirmish ensued, in which that general was slain. By this time Arnold, who was at New Haven, on a visit to his family, arrived on the scene with several hundred militia, and there was a desperate fight at Ridge-field, in which Arnold had two horses shot from under him. The British were driven to their ships, and narrowly escaped capture. Arnold was now pro-rooted to the rank of major-general and presented by congress with a fine horse, but his relative rank was not restored. 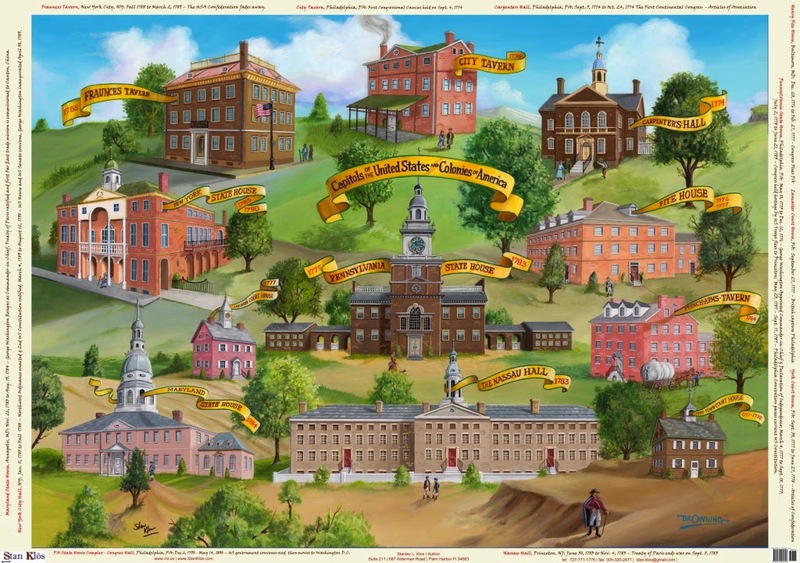 While he was at Philadelphia inquiring into the reasons for the injustice that had been done him, the country was thrown into consternation by the news of Burgoyne's advance and the fall of Ticonderoga's. At Washington's suggestion, Arnold again joined the northern army, and by a brilliant stratagem dispersed the army of St. Leger, which, in cooperation with Burgoyne, was coming down the Mohawk valley, and had laid siege to Fort Stanwix. After Schuyler had been superseded by Gates, Arnold was placed in command of the left wing of the army on Bemis heights. In the battle of 19 Sept., at Freeman's farm, he frustrated Burgoyne's attempt to turn the American left, and held the enemy at bay till nightfall. If properly reinforced by Gates, he would probably have inflicted a crushing defeat upon Burgoyne. But Gates, who had already begun to dislike him as a friend of Schuyler, was enraged by his criticisms on the battle of Freeman's farm, and sought to wreak his spite by withdrawing from his division some of its best troops. This gave rise to a fierce quarrel. 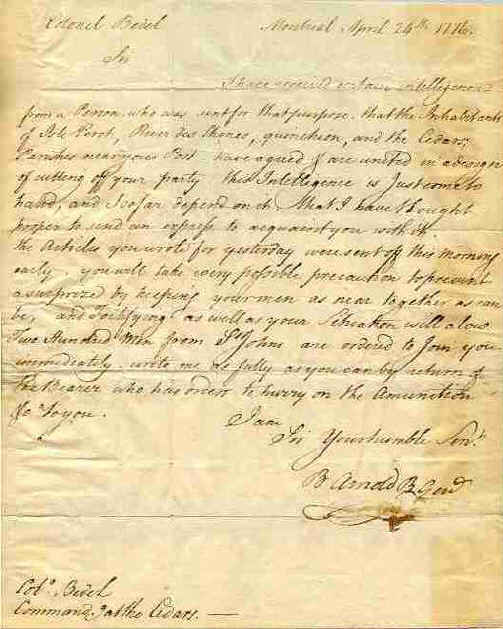 Arnold asked permission to return to Philadelphia, and Gates granted it. But many officers, knowing that a decisive battle was imminent, and feeling no confidence in Gates, entreated Arnold to remain, and he did so. Gates issued no order directly superseding him, but took command of the left wing in person, giving the right wing to Lincoln. At the critical moment of the decisive battle of 7 Oct., Arnold rushed upon the field without orders, and in a series of magnificent charges broke through the British lines and put them to flight. The credit of this great victory, which secured for us the alliance with France, is due chiefly to Arnold, and in a less degree to Morgan. Gates was not on the field, and deserves no credit whatever. Just at the close of the battle Arnold was severely wounded in the leg that had been hurt at Quebec. He was carried on a litter to Albany, and remained there disabled until spring. 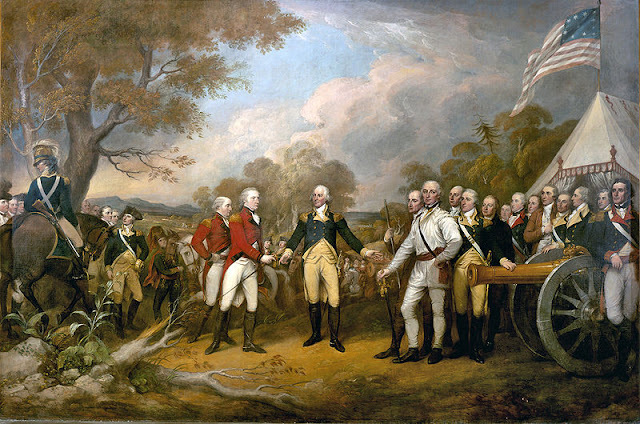 The scene of the surrender of the British General John Burgoyne at Saratoga, on October 17, 1777, was painted by John Trumbull. This victory marked a turning point in the American Revolutionary War. 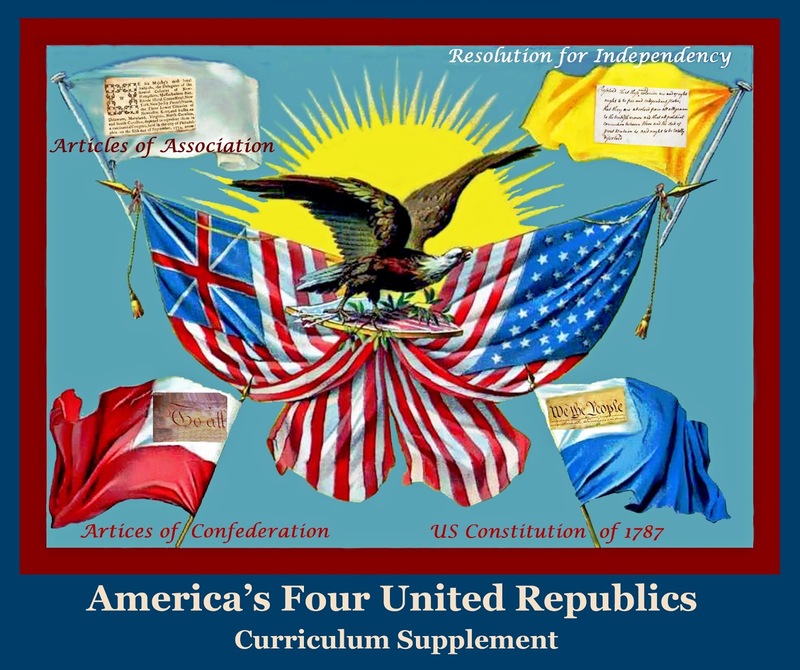 Resolved, That General Washington regulate the rank of Major General Arnold and Brigadiers General Woodford and Scott, agreeable to the resolution of Congress of the 12th of Novr. instant, confirming the principle adopted by the board of general officers on the 19th August, for settling the rank and precedence of officers, and that the commissions of those officers be called in and cancelled, and new commissions granted them in manner aforesaid. 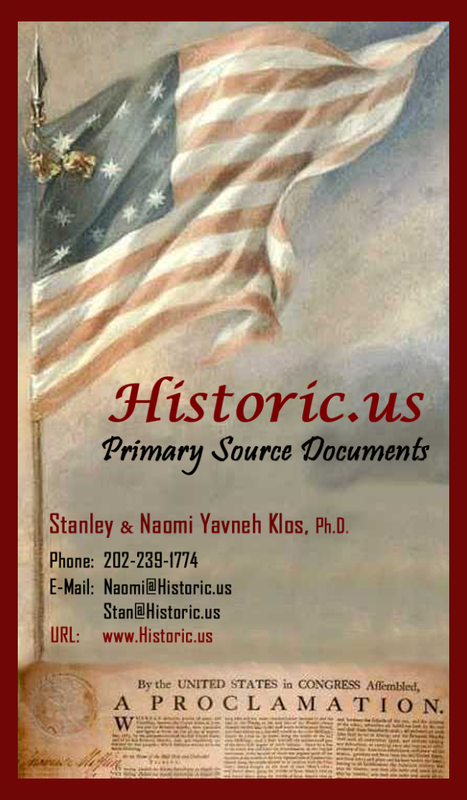 - Journals of the Continental Congress November 29, 1777. Three years had elapsed since Saratoga, and the fortunes of the Americans, instead of improving, had grown worse and worse. France had as yet done but little for us, our southern army had been annihilated, our paper money had become worthless, our credit abroad had hardly begun to exist. 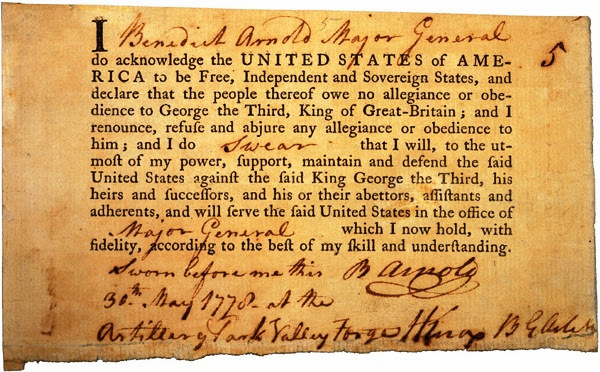 Even Washington wrote that "he had almost ceased to hope. "The army, clad in rags, half-starved and unpaid, was nearly ripe for the mutiny that broke out a few months later, and desertions to the British lines averaged more than 100 a month. 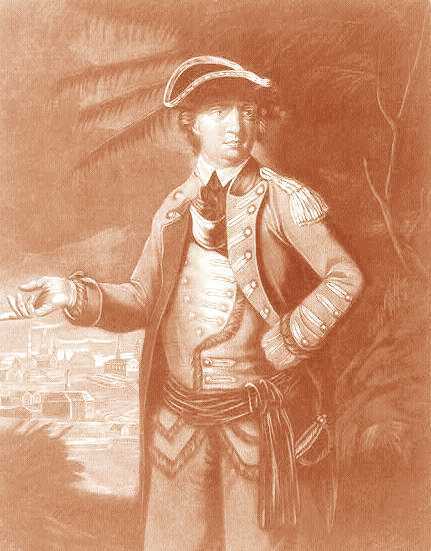 The spirit of desertion now seized upon Arnold, with whom the British commander had for some time tampered through the mediation of John Andre and an American loyalist, Beverley Robinson. Stung by the injustice he had suffered, and influenced by history surroundings, Arnold made up his mind to play a part like that which Gen. Monk had played in the restoration of Charles II. to the British throne. By putting the British in possession of the Hudson river, he would give them all that they had sought to obtain by the campaigns of 1776-'77; and the American cause would thus become so hopeless that an opportunity would be offered for negotiation.